Nukleus is a brand with a mission – to put sustainability at the heart of contemporary fashion. We use business to create solutions to issues of social and environmental justice. We use fashion to empower customers, through their purchase, to do something good for people and the environment. We don’t have a fancy CSR strategy, and we are not just another brand. We exist for a reason – to create everyday solutions for amazing people – our customers. Using innovative and sustainable production methods, we make underwear and basics from eco-friendly materials such as organic cotton, Lenzing Tencel and organic bamboo. Our purpose is to provide a healthy and sustainable fashion choice for the consumers, the planet and the people involved in the production chain. For this to happen, sustainability, as well as fashion, is in the brand’s DNA. We love to buy clothes. However very few people are aware of the adverse impact of clothing on the environment and our society. Indeed, the fashion industry is the second most polluting industry in the world, behind oil and gas. Take cotton as an example, the most widely consumed clothing material in the world. Behind the innocent image of a conventional cotton tee or pair of jeans, there is a vast and hidden transnational empire affecting tens of millions of people, and vast tracts of land and water across the planet. From sweatshop factories to GMO seeds. From farmer suicides to chemicals polluting rivers and groundwater. From seed to shop, the negative impacts of conventional cotton production are harming people and damaging the environment. Conventional cotton is processed using yet more toxic chemicals and water polluting dyes. All of the chemicals used in producing and processing conventional cotton have health implications, from fertility to cancers to allergies. At Nukleus, we care about the health of our customers. We believe that no one should take unnecessary risks with their health. Our organic cotton underwear and basics keep you and your family safe because it doesn’t contain toxic chemical residues from pesticides and synthetic fertilizers and it is produced in an ecologically-safe way. 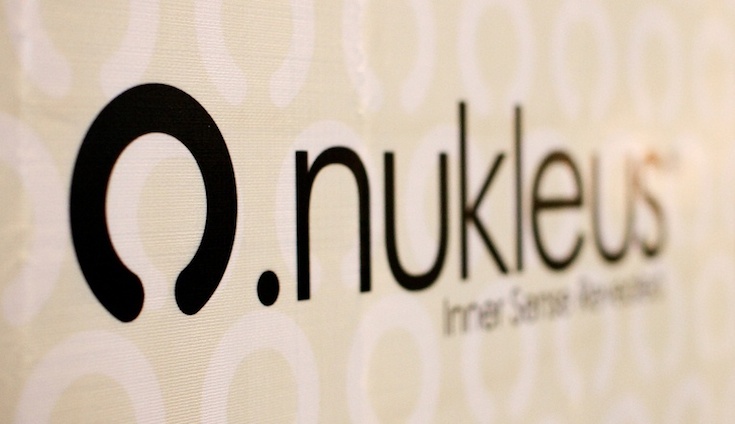 At Nukleus, we also care about the people who grow and make our clothes. 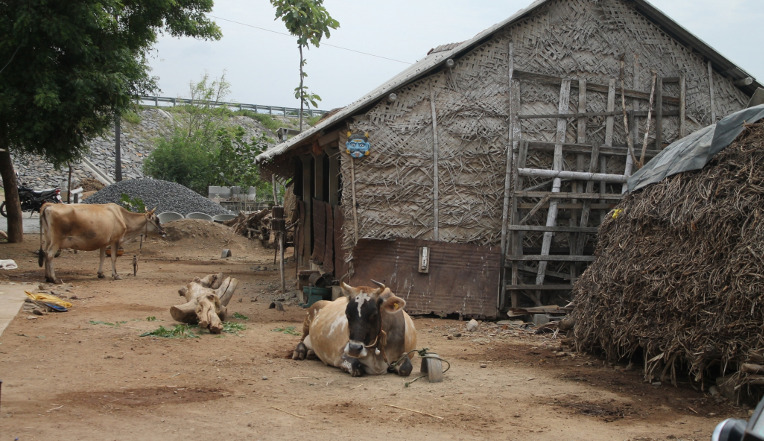 We believe in paying our farmers a fair price, so they don’t get in debt to money lenders. We believe children should be in schools learning, not in factories working. And we believe that these values and basic human decency are important to running a business, and to our customers. Our mission at Nukleus is to empower consumers to make educated, thoughtful and ethical choices about the clothes they wear next to their skin, and to make a stand for their health, the environment and social justice, by purchasing organically produced underwear and basics. Colorful, soft and stylish, Nukleus contemporary classics say I want to be part of a better world, starting with the basics. WHAT DOES NUKLEUS STAND FOR? All organizations have values, implicit, explicit or both. Values contribute to the brand, the company culture and why people buy a particular product, rather than something similar. At Nukleus, we understand that you are concerned about the impacts of your purchases, and we do our best to make our products as environmentally and socially just as possible. For us, being successful in business does not mean we give up our moral values. Instead, it means we have an opportunity to use the brand to promote environmental and social justice. The people who produce the cotton we use are people, just like us. Farmers and factory workers have their hopes, fears, dreams and responsibilities, like us. They have families, concerns about schooling for their kids. They may be worried about a sick relative, the may be looking forward to a celebration, a wedding, religious festival or a birthday. These people are trying to lead decent lives, like us, trying to figure out life on a daily basis, the way we all are. Recognizing our common humanity means we MUST treat each other with respect and dignity, not just our close family, relatives, colleagues and friends, but those whose labor we rely on to make our products. They may live in different countries, with different customs and beliefs, but under the skin, we are all the same. We can all experience hunger, pain, joy and delight. We can be energized or exhausted, happy or depressed. We all bleed. The recognition of our common humanity is key to the values we espouse in our working life and in our relationship with the producers and workers in the supply chain. And it is not just about people, but also about the environment too. From soil to water, to air, to the myriad creatures and organisms which make up the biosphere, we don’t see the planet as an infinite resource to be used up, polluted then discarded, in the quest for profit. It is a precious place, and it is our duty not to wreck it with dangerous chemicals or by using up natural resources. The planet is a beautiful place, and it is our responsibility not to destroy it as we do business. Being an ethical and values-driven company means that we don’t have a gimmicky ‘looking good’ approach to CSR. It is in our organizational DNA, as important as the air we breathe. Integrity means walking the talk of fairness. We strive to be fair, to producers, customers and the environment. We know we do not always get everything right. We are in the process of evolution. It is a steep learning curve, but our commitment is to continue to learn and improve. And yes, we are also about fashion, fun and lifestyle. We want you to like our products, enjoy them and recommend them to your friends. But most of all, we want you to be confident that Nukleus products are not costing the earth. In our own small way, we hope to be a force for good, for positive change. We want to use the power of the brand to educate and influence ALL our stakeholders to understand the value of what we all do on a daily basis. We want to use the power of the brand to help people and the environment. Yes, being organic, sustainable and committed to social and environmental justice is a powerful marketing tool. But, more than that, we strongly believe that a brand has a responsibility, a strategic imperative to be ‘green’. Sustainability is more a journey than a destination. Here at Nukleus, we are on that journey. Sometimes it is difficult, sometimes it is inspiring. But most of all, it is a commitment to walk the talk of sustainability and do as much as we possibly can to help people and the environment. We are honored to have your company and support on this great adventure. WHAT’S GREAT ABOUT ORGANIC COTTON? Organic cotton has all the same qualities as conventional cotton – it’s soft, it breathes well (that is, it admits air to the skin and allows sweat to evaporate), and it is easy to maintain. Furthermore, from a holistic health point of view, it has positive “chi”. All these factors make cotton a great underwear material. There are, however, important differences between organic cotton and conventional cotton. Conventional farming requires roughly 1/3 pound (151 grams) of pesticides and fertilizers to produce enough cotton for a single t-shirt. Despite occupying only 2.5% of total arable land, conventionally grown cotton consumes approximately 16% of the insecticides and more than 10% of the pesticides used in the world. We should note that these agrichemicals are synthetic and petroleum-based—anything petroleum-based is not renewable and therefore not sustainable. More importantly, these agrichemicals are poisonous and persistent. Persistent means that these chemicals don’t go away after use. Some will stick to the cotton and these so-called “residual chemicals” can cause skin irritation and are bad for our health. Some will pollute the environment and harm wildlife; and some will end up in our food. On the other hand, organic cotton is cotton that is produced according to organic agriculture standards. Organic agricultural practices may vary slightly from country to country but common to all is the prohibition of poisonous and persistent synthetic agrichemicals and genetically modified seeds. If cotton is to be sold as organic, it requires a third party certification from independent, accredited certification agencies. The organic cotton yarn used by Nukleus is certified by an independent third party called GOTS. GOTS, or Global Organic Textile Standard, is the world’s leading textile processing standard for organic fibers. This means our cotton is genuine and genuinely organic. It also means it contains no residual chemicals and is therefore good for our health. GOTS-certified organic cotton is also good for the environment. For one thing, no harmful chemicals were involved in its farming. Here’s another: organic farming use less water than conventional farming – around 3,000 cubic meters per acre less, to be precise. Conventionally grown cotton, on the other hand, requires intensive irrigation. If you consider conventional cotton clothing from an end-to end perspective, you will find that it takes an average of about 11,000 liters of water to produce a pair of blue jeans and 2,700 liters to produce one T-shirt. These big numbers are called “water footprints” and they represent the total amount of freshwater used to produce a product. That is, the amount of water used to grow and harvest the raw cotton, convert the raw cotton into usable cotton, and turn the usable cotton into something wearable. 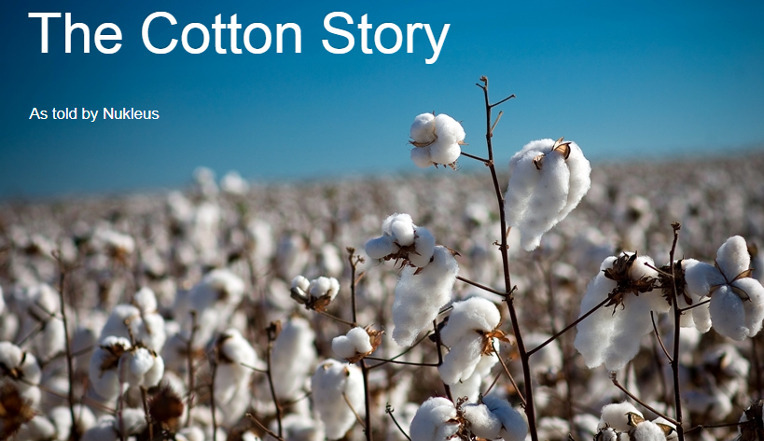 Click here to learn more about the benefits of organic cotton. WHAT ARE TENCEL AND MODAL? Tencel and Modal may be unfamiliar words, but they are actually part of the rayon family. Both Tencel and Modal are famous for their softness. They are also famous for their ability to keep the body cool and dry. These two factors make them popular materials for underwear and basics. Modal’s softness is long-lasting, thanks to its unique surface that resists microscopic deposits; the absence of such deposits prevents fabric hardening. Its color brilliance also remains intact even after repeated washing. Tencel, on the other hand, is such an amazing material that it deserves its own “answer” (please see the next question for more information). We acknowledge that rayon is a synthetic or man-made material. But it is derived from plants (i.e. a renewable resource), and many members of the rayon family are biodegradable. More importantly, not all rayon is created equal. Nukleus buys all its Tencel and Modal from Austria’s Lenzing Group. Lenzing is the worldwide leader in fiber innovation and the winner of multiple prestigious environmental awards in Europe, including the European Award for the Environment. As a manufacturer, Lenzing is sustainable in terms of energy use, raw materials and production process. It inhibits bacterial growth naturally: Tencel’s high absorption capacity and rapid moisture absorption capacity rate make it difficult for bacteria to grow, and it does so with no chemical additives whatsoever. It inhibits fungal growth: When it’s humid. fungi will grow. The bad news is, dust mites consume fungi. Lab tests have shown that Tencel can inhibit fungal growth. Which means less fungi, fewer dust mites, much lower risk of allergies. It has neutral electric properties: this reduces the occurences of annoying static shock. As mentioned above, Tencel is made mainly from eucalyptus. These trees can grow on “marginal land”, land that can’t be used to produce food. They can also grow very quickly without genetic engineering. They don’t need artificial irrigation, either. Lenzing sources its eucalyptus wood exclusively from sustainable plantations, most of which are Forest Stewardship Council (FSC) certified. In addition, Lenzing uses a revolutionary process to manufacture Tencel. Known as the close-loop process, it redirects waste products back into production—99.5% of the solvent is recycled—creating almost no waste. Furthermore, the solvent is non-toxic and its safeness has been proven in dermatological and toxicological tests. All in all, the close-loop process reduces the number of steps involved and the amount of chemical used (i.e. fewer chemicals and less harmful chemicals are used). The end result: Lower chemical intensity which is good for consumers and planet Earth. Click here to read about the Tencel story. WHAT IS UNIQUE ABOUT BAMBOO? Apart from health-related benefits, bamboo is also a very green clothing material. Firstly, bamboo can grow very fast. It’s the world’s fastest growing plant and can be harvested annually and sustainably after four to five years. Bamboo is also self-regenerating. This means that after the stalk has been cut, it rapidly regrows from the remaining rootstalk. Secondly, bamboo can grow on marginal land and without much water. Thirdly, bamboo has an unrivalled capacity to capture carbon. Some reports suggest that bamboo can sequester 12 tons of carbon dioxide (the greenhouse gas) per hectare, 30% more than trees. Fourthly, bamboo can prevent soil erosion, which can ultimately lead to landslides. Bamboo’s elaborate root system is like a net under the soil, holding everything together; so that when it is pouring, the soil is not washed away. Click here to read about the bamboo story. WHAT IS GLOBAL ORGANIC TEXTILE STANDARD (GOTS)? 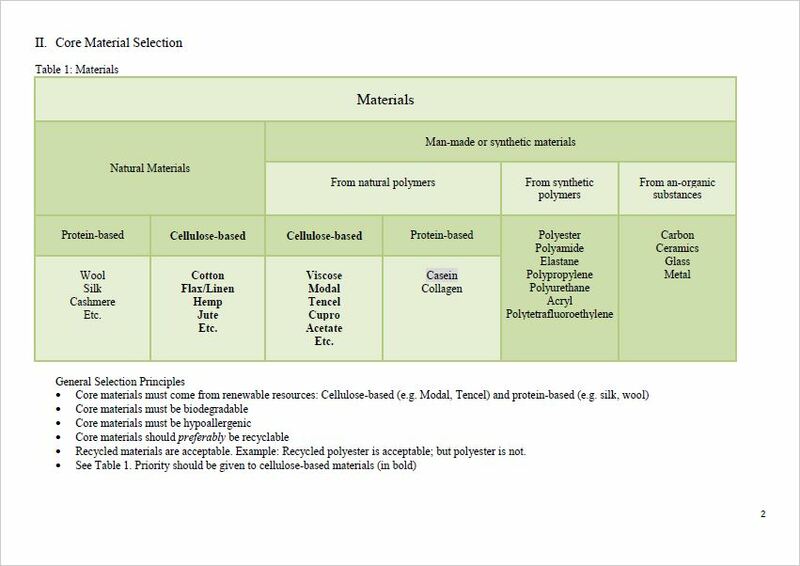 The Global Organic Textile Standard (www.global-standard.org), or GOTS, is the worldwide leading textile processing standard for organic fibres. Nukleus uses only GOTS-certified organic cotton yarn for all our products. 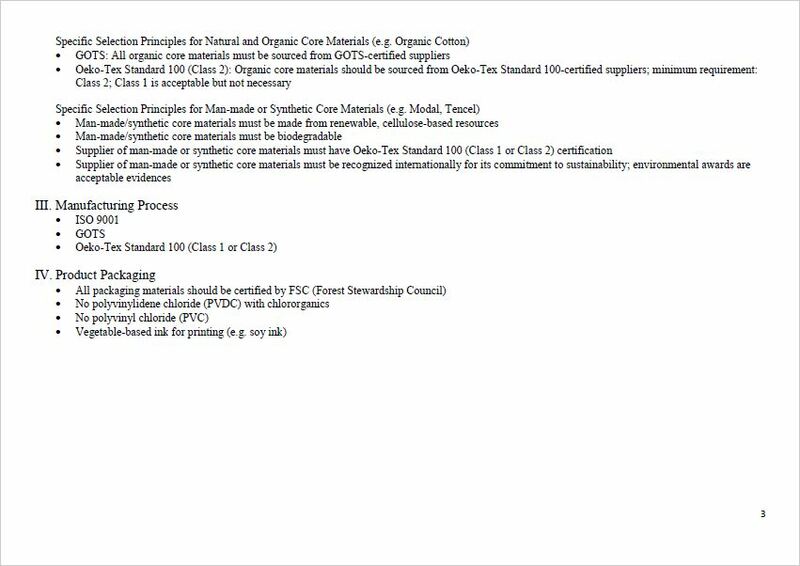 WHY DO WE NEED OEKO-TEX STANDARD 100? The Oeko-Tex Standard 100 (www.oeko-tex.com) is like an extra layer of protection for the consumer. This additional layer is necessary because good materials aren’t automatically safe—if a factory uses the right material but the wrong manufacturing processes, the end product may still not be a good one. If the consumers want to be 100% sure that he is buying safe clothing, he should look for products with the Oeko-tex Standard 100 label. When shopping for safe underwear or basics, the consumer should consider only Oeko-Tex Standard 100 products. All Nukleus core components are certified Oeko-Tex Standard 100. That means our innerwear is safe for all skin types and perfect for all-day wear. The bottom line: The Oeko-Tex Standard 100 gives the consumer peace of mind. WHAT’S SPECIAL ABOUT THE NUKLEUS ECO-BOXES? Nukleus uses only FSC-certified paper for its eco-boxes because this type of paper is sustainable. The FSC, or Forest Stewardship Council (www.fsc.org), is a globally trusted organization that promotes responsible forest management e.g. appropriate harvesting rates and techniques, non-chemical methods of pest management, etc.). Many independent individuals and organizations—Greenpeace, the World Wide Fund for Nature (WWF) and renowned environmentalist Jared Diamond, among them—have endorsed the FSC. Besides that, we use vegetable-based ink (i.e. soy ink) to print our boxes. Soy ink has low levels of VOCs (volatile organic compounds). VOCs are unstable compounds that vaporize readily into the air. When they enter the air, they react with other compounds or elements to produce ozone, which causes air pollution and a host of health problems like breathing difficulties, headache, and nausea. Some VOCs have been linked to cancer, kidney damage and liver damage. Soy ink is also sustainable because it is derived. In addition, Nukleus uses fully recyclable PETE 1 plastic for its box “window”. 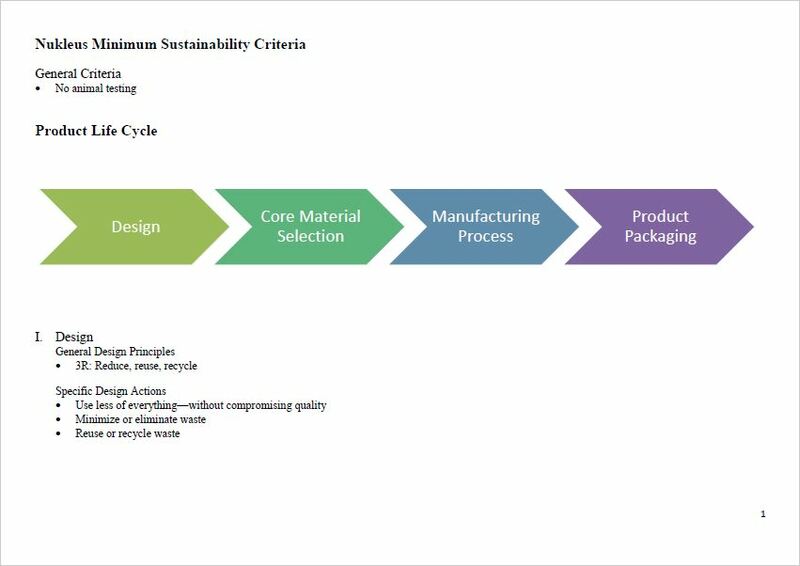 At Nukleus, we believe that sustainability should be seen as an end to end process, from conceptualizing the product, sourcing the materials, manufacturing, packaging and product disposal. Every part of the value chain has implications for the environment, and that is what we attempt to address with Nukleus. Formerly a co-brand partner of the Worldwide Fund for Nature (WWF) Malaysia, Nukleus is guided by the WWF’s Global Sustainability Criteria in all its product development. We are not 100% but we are constantly striving to become better. We believe that the journey to sustainability is one of continuous learning and improvement. The key is to be honest. We are not perfect. We are learning all the time, but we are committed. We apply the sustainability concept as an end to end process. It is a lifecycle process to create a truly green and sustainable brand.